It’s that time again. Heading into the busiest fantasy football draft weekend of the 2017 season, we are all prepped up and ready to go. Ezekiel Elliot remains one of the most difficult players to rank, but remains a top-20 play. While my deep rooted Cowboys’ hate may prevent me personally from spending a second round pick on the second-year back, the potential for game changing numbers over even half of a season make him an intriguing risk. We’re also confident in a number of bounce-back performances with Lamar Miller, CJ Anderson, Cam Newton and Jeremy Maclin appearing much higher in our list than FantasyPro’s consensus rankings. Though it sounds like a bit of a broken record year to year, we’re fading the rookie running backs once again, ranking Leonard Fournette, Christian McCaffery and Dalvin Cook a solid 20 spots below each of their consensus positions. Yeah, I get it, there were a number of high-impact fantasy rookies who helped teams last year, each of these backs is faced with an uncertain role to open the season behind (or beside) veterans who really aren’t all that bad. I’m certain that one of these guys will contribute, I’m just not spending a 3rd round pick to find out which one it will be. We’ll be back tweaking and updating this list as the draft season progresses. Let the games begin! A jam packed Sunday of football brings of NFL action across two continents with the Jacksonville Jaguars facing off with the Indianapolis Colts in Wembley Stadium. We’s also got a couple of intriguing matchups highlighted by an AFC showdown between the Chiefs and Steelers on Sunday night. Look for the Jets to get back on track and “upset” the Seattle Seahawks who are taking a trip across the country to play an early game. Sunday brings us another glorious day of football. Let’s see what trends hold up from the first two weeks and continue to shape the landscape for the season. We’re buying No. 1 overall QB Matt Ryan to continue his success in a Monday night showdown at the Super Dome. Welcome to another wonderful football season here at BretskyBall. 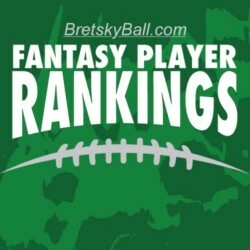 Heading into your fantasy draft season we’ve wrapped up our top-200, positional and PPR fantasy football rankings. The quarterbacks are a tough group to pin down this season as we saw a couple of top-flight options fall back to the pack in 2015. The top tier spans the top-7 names in these rankings, with Tom Brady’s impending four-game suspension the only thing keeping him out of that group. Eli Manning bounced back nicely from an awful 2013 season with a pair of 30+ TD, 4400-yard campaigns. Amazing what an all-world talent on the outside can do for you. Year three under Ben McAdoo should be more of the same. Blake Bortles at 15 likely represents the biggest surprise out of the top two tiers, but after leading the league in interceptions during his breakout sophomore campaign it’s hard to imagine that the Jags coaching staff allows him to lead the league in red zone passing attempts for a second straight season. With the offseason addition of Chris Ivory signaling a more run-heavy approach for 2016, Bortles sits behind veterans Matt Ryan, Andy Dalton, Philip Rivers and Kirk Cousins as well as fellow sophomore Derek Carr. While Adrian Peterson gets the nod at the top spot overall — any of the top 8 could finish at the as the king of the hill. Lev Bell is simply too talented to let out of the top-10 and potential owners have to love seeing his suspension reduced to three games. C.J. Anderson is getting no love in the preseason (RB14, 34 overall in consensus ADP data), despite averaging 4.7 ypc last season and 6.7 ypc over his last seven games. Tier 1 stops at Elliot, the (mostly) healthy and in-their-prime bellcows with Bell, CJA, Doug Martin and Eddie Lacy forming the second tier. Jonathan Stewart’s checkered injury history that includes multiple lower-leg issues leaves him out of this second tier and begins a new one including Carlos Hyde in Chip Kelly’s back-friendly system. Young risers Thomas Rawls and Latavius Murray as well as veterans LeSean McCoy and Ryan Matthews. You absolutely want to leave the draft table with at least one of these top-18 backs. Missed time is the only thing that will prevent this group from returning RB1 value. Tier four is also full of juice but the question marks are too big to ignore. Does Bilall Powell block Matt Forte from seeing anywhere near the volume he enjoyed in Chicago? How many games can Arian Foster get in? Does Demarco Murray bounce back? If you feel confident in any of these answers feel free to thrust these veterans up a round or two in your pre-draft list.